In the 1600s, over 220 million acres of wetlands are thought to have existed in the lower 48 states. Since then, extensive losses have occurred, with over half of them being drained, filled or converted to other uses. The picture is similar in Pennsylvania. In the late 1700s, the Commonwealth had over 1 million acres of wetlands. Today, less than half remain. 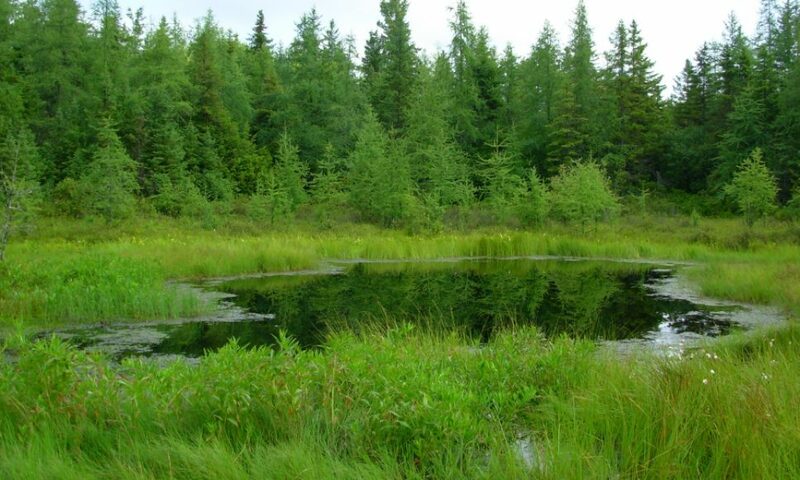 Most remaining wetlands in PA are located in the glaciated northwestern region of the state and the glaciated northeastern Pocono Mountains which includes Pike County. Flood Protection – Wetlands provide flood control by absorbing rainfall and stormwater runoff, slowly releasing this water overtime, helping to prevent downstream flooding. Groundwater Recharge – Water held by wetlands can soak down through soil and rock layers providing replenishment or recharge of groundwater supplies – a benefit that becomes particularly important during dry periods. Water Filtration – Wetlands act as natural filters, removing harmful substances that otherwise accumulate in surface and groundwater affecting humans and wildlife. Heavy metals and nutrients such as nitrogen and phosphorus are taken up by wetland plants. Economic Value – Preserving wetlands can save taxpayer dollars by reducing flood-related property damage and reducing or eliminating the need for expensive flood control structures. Wetlands can add to property values by keeping water clean and by providing open space. Human-made wetlands have been used as cost-effective alternatives to expensive wastewater treatment technologies. Wildlife Habitat – Wetlands are among the most dynamic ecosystems in the world, comparable in diversity to rain forests and coral reefs. An immense variety of plants, insects, amphibians, reptiles, birds, fish and mammals live in wetland ecosystems. Many plant and animal species are entirely dependent upon wetlands for survival. The high biological productivity of wetlands makes them vital ecosystems, not only to the plants and animals that directly depend on them for food and shelter, but to humans as well. Recreation and Aesthetic Values – Wetland areas provide opportunities for hiking, bird watching and nature photography among other recreational pursuits. Hunters and anglers of wetland-dependent animals and fish rely on wetlands to support and maintain their recreational activities. Identify and take steps to protect wetlands on your property. Technical assistance can be obtained from the Pike County Conservation District, the PA DEP, the US Army Corps of Engineers or private consultants experienced in wetland delineation. Plan ahead to avoid “encroaching” on wetlands and maintain buffers around wetland areas to minimize impacts when developing or improving a site. Support your local community association or municipality in any efforts to incorporate wetland protection into community codes, comprehensive plans, and land development ordinances. Support your local land conservancy, watershed group or community association in efforts to acquire and permanently protect wetlands in your community. Purchase federal duck stamps from your local post office to support wetland acquisition nationally. Before engaging in any activity that could affect wetlands, check with your local Conservation District.